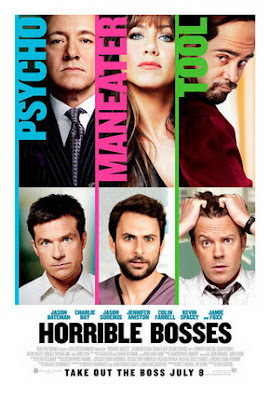 Jason Bateman, Charlie Day and Jason Sudeikis play three friends each having their lives ruined by their respective bosses played by Kevin Spacey, Colin Farrell and Aniston. They decide, as you would, that their only option is to kill their bosses and after seeking advice from the excellent Jamie Foxx, set about putting their plan in place. For the most part the dialogue is sharp and funny although the movies at its best when it drifts into farce. Not every gag is killer and there are times when you feel like the gaps between laughing out loud are growing longer. Spacey is great as Bateman's manipulative boss but Colin Farrell is criminally underused as a coke addled drug fiend. Horrible Bosses has its moments: there was actual out loud laughing on more than one occasion, but I can't help but feel in a month we'll have forgotten all about it.